Experience drives beliefs drives behaviors drives results. Leaders do first two; mangers second. Steward and Catalyst Actions: How to do it? Every one of us has power. We need to stop our organizations from blocking that. If you are here, Dana and I have a session Wednesday at 1pm! “Growing by Sharing: Transitioning a Group to a Self-directed model” — a workshop. Productivity is sometimes shunned by Agilists. His biggest issue is 61% of Agile teams aren’t delivering. Big companies are moving Scrum out of IT. So have to make implementation conversations everywhere. Moore’s Law and exponential increase. Intel: what we’ve learned is nothing scales. Only fractal things scale. 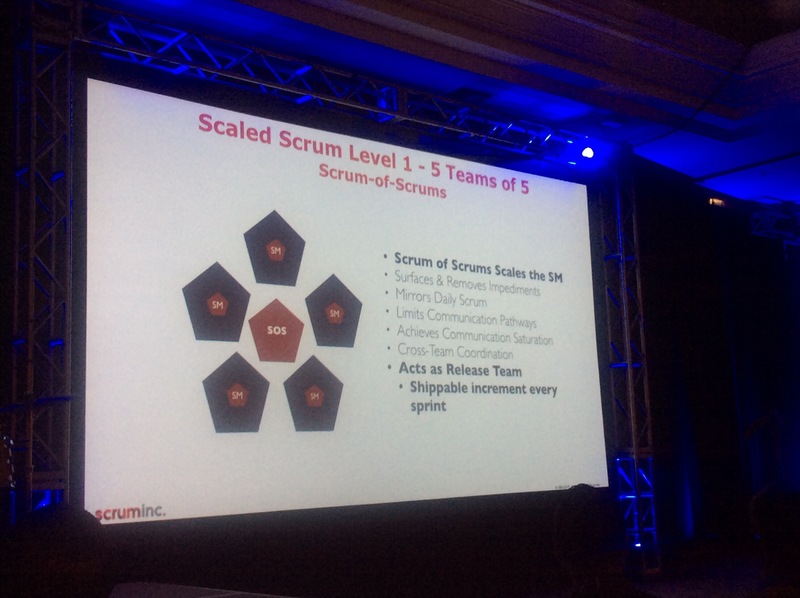 The only things that scale is the internet and Scrum. Jeff is going into detail on how to scale. Jeff’s company does not allow 9 people. Max is five at his company. Scrum of Scrums instead. Have an Executive Action team that helps with impediments. Hold meta Scrums. Keep it fractal. Saab is doing this. 3m doing. Started in health. Now their HR team is doing it. Maersk was able to reduce costs with Scrum. Shipping part of company invited in. Referenced moneyball, book and movie. They crunched data and figured out those who got to first base got runs. BoSox did that and won series. GE assessment: developers were doing things no one wanted. If you know the efficiency number, raising that number is best thing to get Scrum to scale. Everything in Scrum is data-driven. And this helps scaling. He is consulting on changing the Toyota Way. Getting rid of requirements. BMW: there will not be a single non-Scrum person at the company. Microsoft after 10 years can now deploy every day. Tesla – increasing market cap. Only shipping 50k a year. BMW realizing they have to compete on this. Agile is a different operating system. Have to change your business API and procedure calls. Skype: because of the rat nest of dependencies, took 7 months to change a line of code. To fix, implement Scrum: Find biggest problem and fix that. Spotify. Why are projects late if all stories are early, they asked. Then they realized it was the managers. If Jeff was asked in 1993, he never would have guessed this many people. So in another 20? No idea, but think it will be awesome! Awesome talk by Heidi Helmand. These are raw notes. People misinterpret keep your teams stable with keep your teams the same. This is about dealing with the reality if changing teams. Told her story. Was doing interaction design. Was pulled off and put on an innovation in isolation team. Worked on gotomeeting as a result. Team put off to side, disrupt status quo. Examples of Citrix and grasshopper. Secure docs. Reteaming brings freedom (from process). Does research, watches for patterns. This is about PEOPLE. Issue she had with keynote was the human side. This is our lives. Don’t want to be a feature factory. Stagnation is real. So bringing in new people can stop that. Always learn new, feel reenergized. @ppfolio – had a cake baked for them by customers. Building right values continuously. Read the emotional feed, but don’t avoid conflict. Geek joy – if you see this pattern, don’t break it up. How companies form teams and how people get on teams. Interesting when teams self-select. Put boards up and could put your avatar on team you wanted. Unruly (company in London) does it with a survey. Hunter, where mob programming invented. Team members negotiate change. Mobbing is working on one computer and coding as a group. Companies having Disappearances of team members because of re-prioritization done on management level. Cloud Foundry does a lot of deliberate reteaming to create empathy, sustainability, outsmarts mythical man month. Question is not “How can he get 2 times faster work. It’s about the team and how can you share knowledge. At Menlo get to re-roll and change. High-tech anthropologists. Procore Tech: changing roles in team. 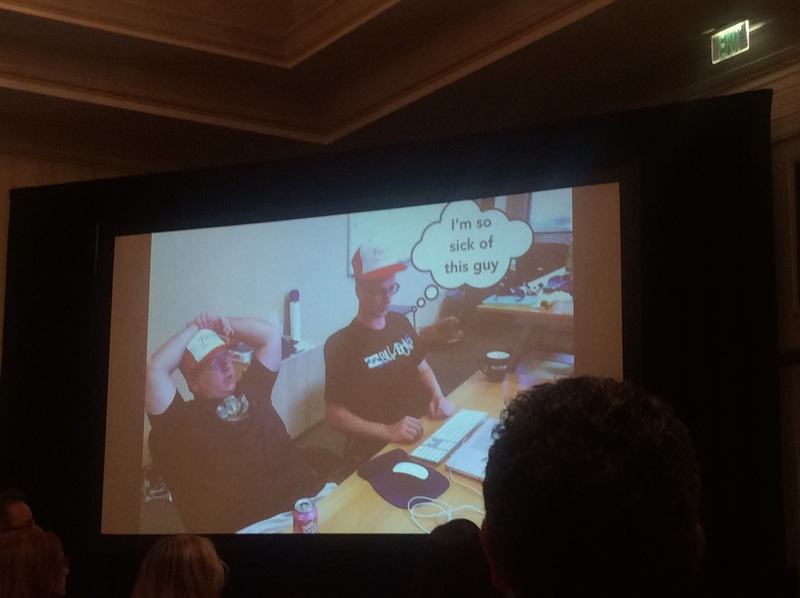 Geek Joy, Mike Hill, but sometimes get sick of teammates. She used to be the pair police, but not any more. Use often, but be open to mob or other forms. Making team contracts. Use Alyssa Adkins Journey Lines with teams to get to know each other. Equalize local and remote. Get to know each other! Use video for non-collocated teams.